Is it snowing in Megeve ?¡Gracias! Megeve (Megève) is situated about 10 km off the main road from Geneva to Chamonix and is one of the most chic villages that one could hope to come across. 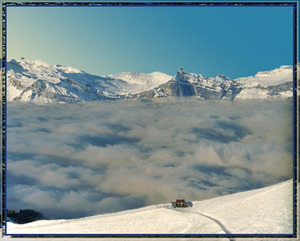 Megeve is the main part of the Evasion Mont Blanc ski area - the 4th largest in France. There are three main ski areas; Mont D'arbois, Rochebrune and Le Jaillet, which offer 325 km of pistes and are served by 88 lifts. The Evasion skipass also includes nearby Les Contamines (120km pistes) but you would need a car to get there. In practice for most holidaymakers Megeve is big enough. 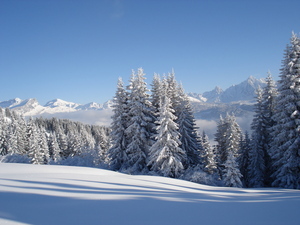 With the resort being relatively low, much of the skiing at Megeve (Megève) is on beautiful tree-lined slopes with spectacular views of Mont Blanc. A particular feature of Megeve is that outside the peak french holidays the pistes are deserted and you ski straight onto the lifts. There is a wide variety of mountain restaurants. 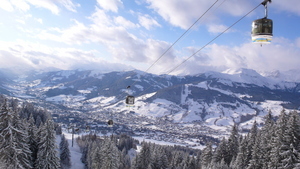 Megeve is a year-round resort with a full range of facilities including a large sports complex, outdoor pool, horse drawn taxis, many quality restaurants and some excellent designer shops in an atmospheric pedestrian area. The village of Megeve (Megève) retains a very French feel unlike some of the resorts which have succumbed to the invasion of the Brits, this can be seen as a plus or a minus depending on one's viewpoint. Polo on snow from 9-12 March - free admission. Most lifts close on 17 April, but the Princess and Jaillet close on 2nd April. Cote 2000 stays open for a week or two after the main resort closing. We booked a return shuttle from Geneva Airport to Megeve with MegevExpress (ChamExpress) The outbound shuttle left 2 hours late, the vehicle was extremely unsafe (inadequate seatbelts and brakes barely working). Our return shuttle never arrived after waiting for 1.5 hours at our pick up point. None of the phone numbers on their website are real numbers. We had to take a private taxi as a result. The extremely rude and incompetent staff said a refund was not possible. I have reported them to the Geneva Airport authorities as well as the French/Swiss tourism regulators. Never ever travel with them! The whole thing is a scam and will ruin your ski holiday! 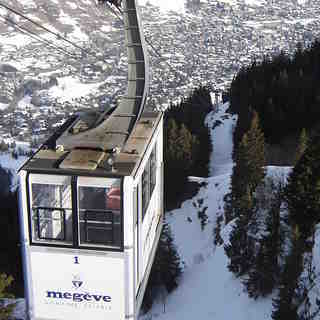 Megeve is fantastic for skiing despite this travel company!